March 19 atthe Mission High School Auditorium. One student had played the cowbell in band class, another the tambourine and bells. 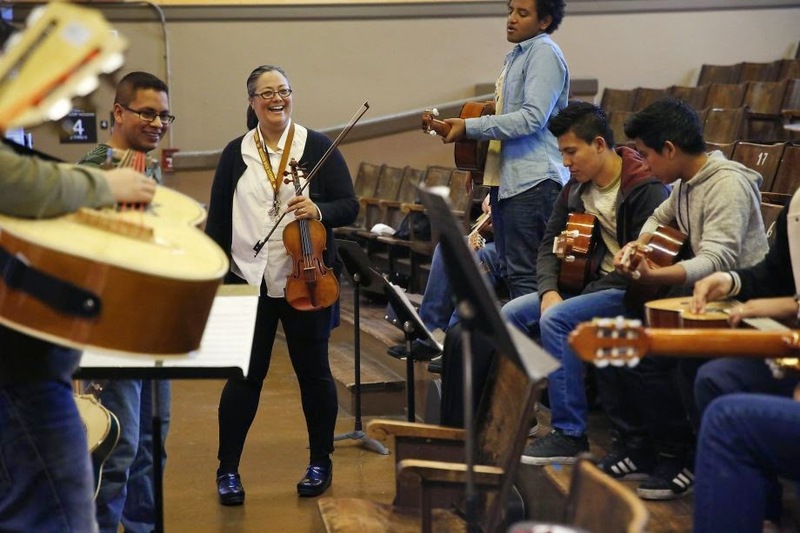 But few of the 12 students sitting in the small theater at Mission High School had ever picked up a guitar until January, when they walked into the district’s first mariachi class in 30 years. Seven weeks later, the students strummed the chords to “Volver, Volver,” a classic mariachi song about lost love and yearning, a real tearjerker. Some of the teens struggled to keep up with chord changes, but the melody was unmistakable. Eddy Flores de León, 16, was the one playing cowbell in band class when he made the switch to guitar and the mariachi class for the spring semester. Originally from Guatemala, he was unfamiliar with the Mexican music. A few days later at the district office, Superintendent Richard Carranza watched a video of Eddy and his classmates playing the Mexican love song and his face filled with emotion — a combination of joy and pride mixed with a bit of deja vu. In the early 1990s, he had started a similar program in Tucson, where he was a social studies teacher at a school that was 92 percent Mexican American. The program started with 11 students, and within 10 years Carranza was a full-time mariachi teacher with 250 students and a premier performance group, Mariachi Aztlán, that was paid for its gigs and toured the country. The money paid for college scholarships for the kids — $2,000 for each year the high school students were in the elite band. Carranza, a mariachi musician, said the program turned gangbangers into musicians with at least a 3.0 grade point average, which was required to perform. And parent involvement exploded, as families held food fundraisers to buy costumes and showed up at performances to support the students, who won accolades across the country.